My Work From Home Routine with a Baby | Glitter, Inc. This work form home routine post has been sponsored by DannoneWave and belVita. All thoughts and opinions are my own. Thank you so much for supporting the sponsors that make Glitter, Inc. possible! Now that we’re adjusting to life with a newborn (and a toddler), I’m ever-so-slowly easing my way back into a work from home routine. 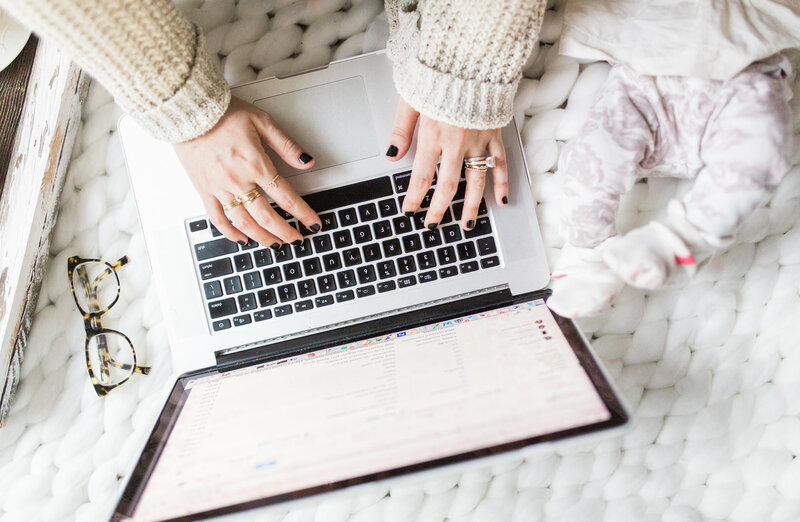 Truth is, I got right back to work just a few days after having baby number two, but because I work from home, I’ve been able to increase the work at my own pace and figure out what works for me in a house with two little ones under three. I’ll admit, some days, it’s total chaos. My poor husband comes home after his own loooong day at work (he’s a resident), and I feel like I’m nearly throwing the kids at him, racing to hide in the bathroom, if even for five minutes. This mom gig is hard, I tell ya. As I type, I have a fussy baby, all swaddled up in the crook of my arm, and she.just.won’t.sleep. But I digress. I’m up and at ’em by 6:50am (7:00am if I fall into the dreaded snooze trap. )* I quickly brush my teeth, wash my face, gulp down my medicine, throw on clothes, steal a quick sip of coffee, take the baby from my hubby (who’s an earlier riser), and I’m up the stairs to get our toddler started for the day as well. *Mind you, I could get up earlier. I know there’s some parenting magic to waking up earlier than your kids in order to get more things done, but I just can’t do it. I am EXHAUSTED, and though I’m pretty perky once I’m on my feet (with coffee in hand), I’m so crotchety before about 6:45am. Anyone else THE WORST at early mornings? Once our toddler is up, we quickly run through her routine – bathroom, teeth-brushing, dressed, breakfast, backpack and lunch box on, and out the door she goes with her Dad for preschool carpool. For the record, putting our oldest in morning preschool five days a week was THE best decision ever. There’s a bit of a juggle between the two girls in the morning. Sometimes our newborn decides to cry or need food (right that instant, naturally), and I’ve learned to do a lot one-handed. 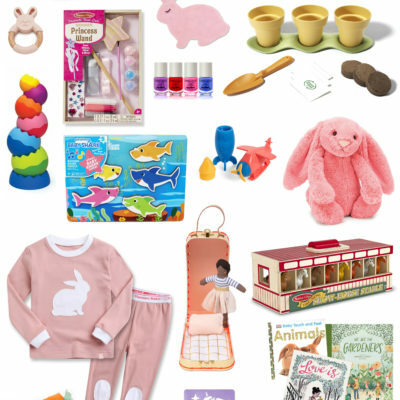 In some ways, having a new baby has really helped to encourage our older daughter to be a bit more independent. Thank goodness for that! Hubby and toddler are out the door and I’m inevitably re-heating my coffee. Then it’s a good 20-30 minutes of scrolling through emails, flagging what needs to get done ASAP, and willing our newborn to fall back asleep. Breakfast time. One of the best lessons I’ve learned in adulthood, is realizing things like breakfast actually matter. 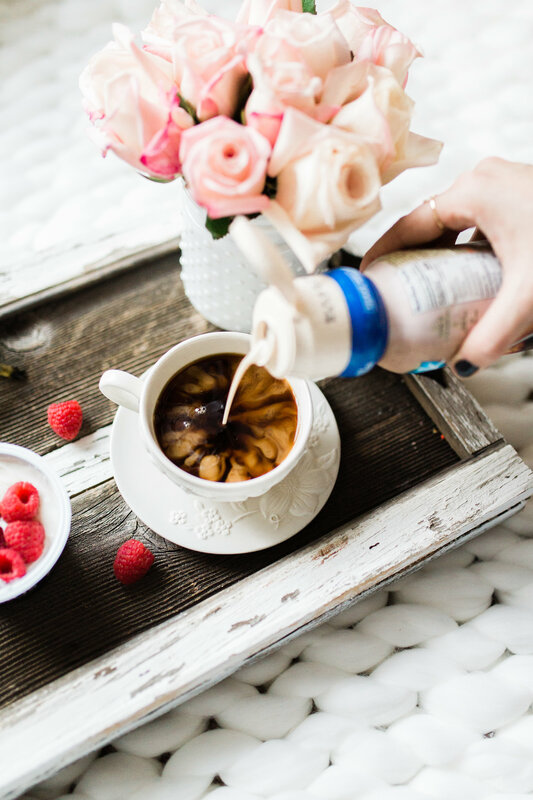 Over the last few years, no matter how hectic my routine has gotten, I always try to include a quick and better for you breakfastt to help jumpstart my busy day. That’s not to say I’m always perfect. And sometimes, I’ll look up at the clock, only to find it’s 10:45am and I haven’t had a bit to eat; but most mornings, I try hard to eat something balanced and early enough in my day to actually help give me that energy I need. I recently stumbled upon a new breakfast combination that really takes the guessing game out of my breakfast struggle. I don’t know about you, but even trying to decide on a smart breakfast can make me feel overwhelmed; especially on a hectic day. 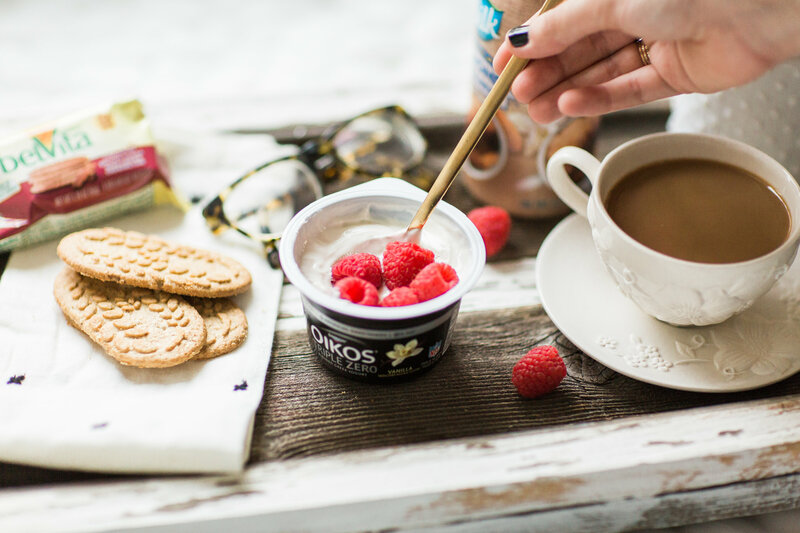 My new handy breakfast of choice: Oikos and belVita Breakfast Biscuits (paired with Silk Creamer and coffee.) Oikos contains 30% of the recommended daily serving of protein and belVita is a good source of fiber. I swear the belVita Blueberry Breakfast Biscuits taste just like a blueberry muffin. SO good. I usually top my Oikos with berries and I’ve got myself a stress-free balanced breakfast. After breakfast, I’m all about flexibility. I’ve learned to weave work throughout my days taking care of the baby. Thankfully, in between all of the eating and holding, most newborns sleep a fair amount. Things like a baby swing and the DockATot are a lifesaver for being able to put the baby down for a bit here and there. I try not to leave projects on my to do list until deadline day because babies have a mind of their own, and on the morning I might HAVE to get something done, my little one could be in the worst mood ever. Often at this time of day, I’m finalizing a post and hitting publish. Any extra time after that and I’m back to emails. Anyone else feel like the emails are never-ending? Typically, at least once a week, my photographer comes over and we shoot content for upcoming projects. I often wear baby in a wrap (loving this one right now) after feeding her, to have my hands free for styling. Shoot days are always a bit chaotic – especially trying to juggle a newborn’s demands with needing to set up and stage multiple projects in a short time-frame. I’m always SO glad I ate a balanced breakfast before busy days like this. Once our photos are done for the day, it’s often time to feed the baby again. After that, back in the carrier she goes, so that I can get to new emails. I also typically start to focus on scheduling social media content for the day. That includes, posts to Facebook, Twitter, Google+, Bloglovin’, Instagram, and Pinterest. While I do schedule a lot of my social media out for the week on Buffer, I like to also post the day-of to keeps things organic and to interact with others. I also usually try to answer questions as I get them throughout the day. It is all about being social, after all! We’re bundling up and heading to my toddler’s preschool to pick her up. What does your morning routine look like? 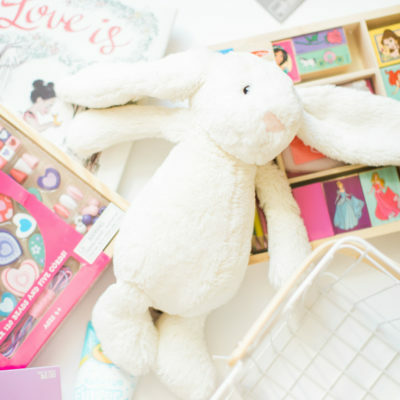 If you have kids, how do you juggle it all; especially on your busier mornings? 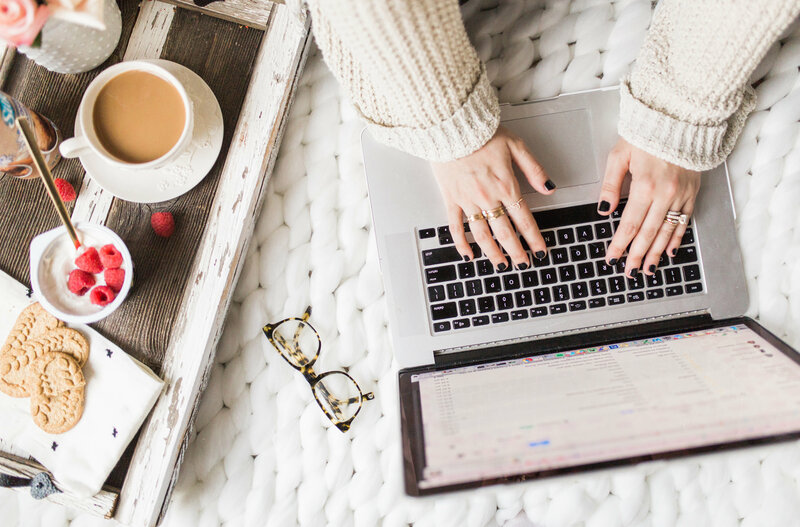 Do you have a work from home routine too? 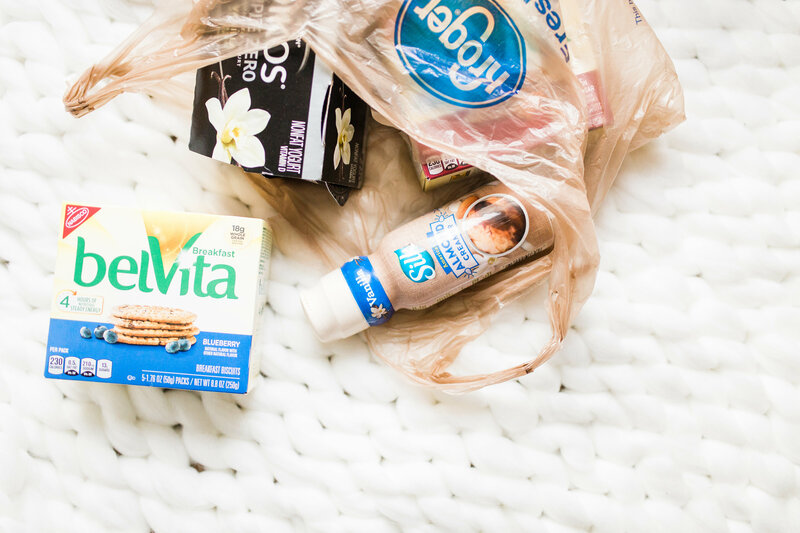 You can pick up your favorite Oikos, belVita, and Silk products at your local Kroger. 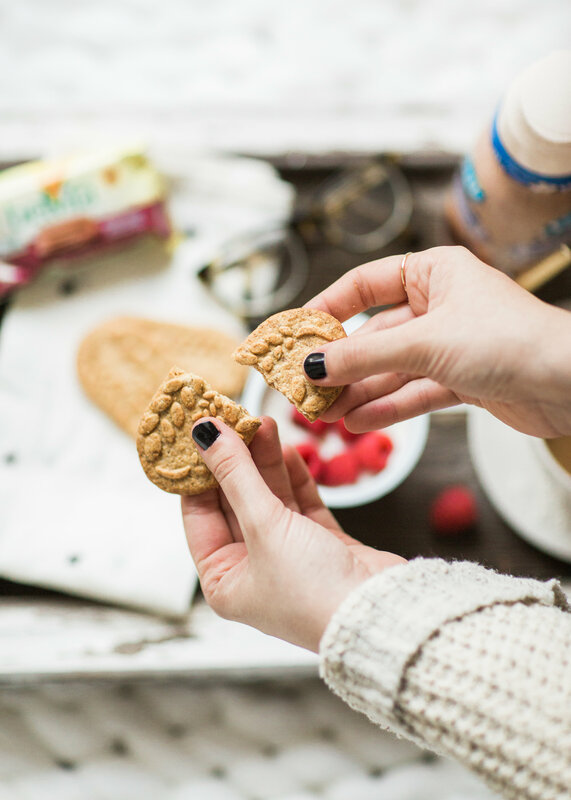 Oikos can be found in the Dairy Aisle and belVita Breakfast Biscuits are in the Cookie Aisle. 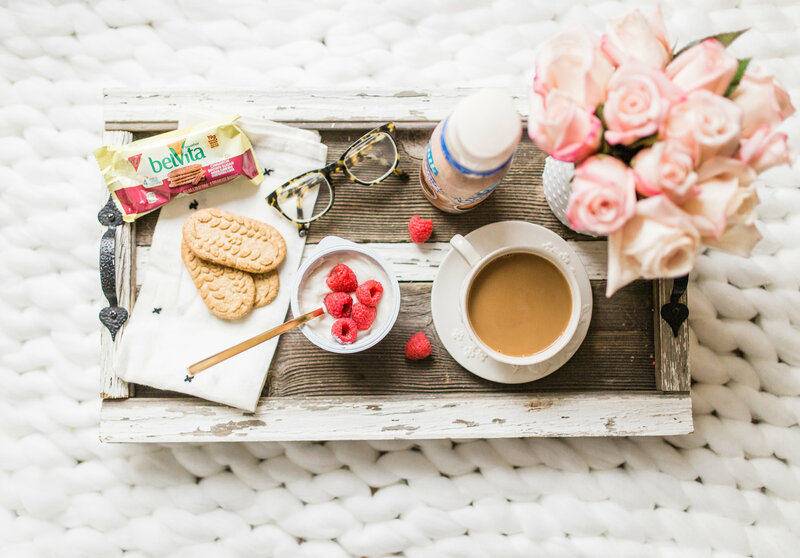 Plus, if you purchase belVita Breakfast Biscuits + Oikos Triple Zero Multipack, you’ll receive a free Silk creamer. 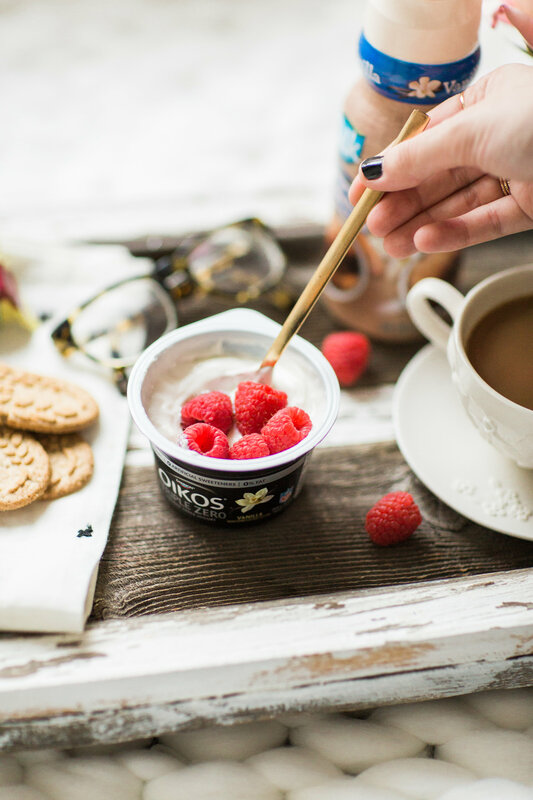 Just visit this link to download the load to card coupon and Get 1 Silk Creamer Free when you Buy 2 Oikos Greek or belVita Breakfast Biscuits through 1/31/2018. Love this post? 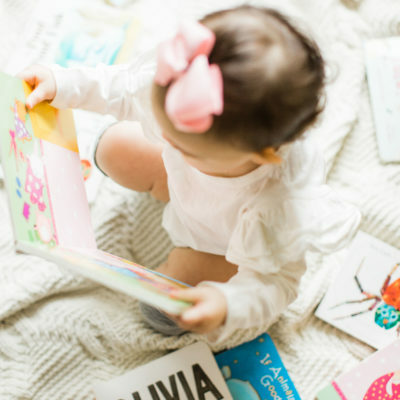 See more of our life with two little ones here. This work from home routine post contains affiliate links, which means that if you click on one of the product links, I’ll receive a small commission. Thank you so much for clicking through and helping to support this little blog business of mine! Read more about our site, privacy, and disclosure policies here.